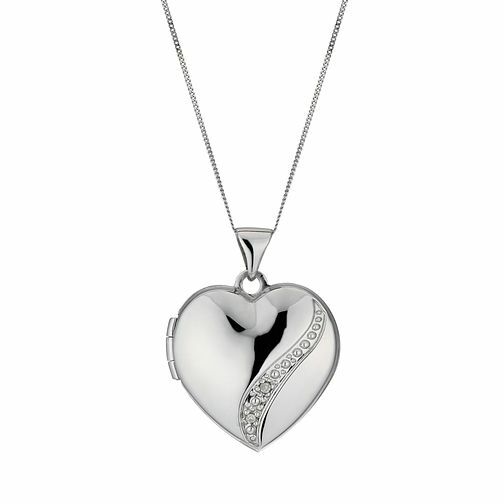 A classic 9ct white gold locket crafted into a delicate heart with a wave of sparkling diamond embellishment. Finished with a hinge opening revealing a deep red lining, this is a simple yet elegant necklace ideal for treasuring your fondest memories with a photograph. The perfect keepsake for someone special. 9ct white gold diamond set heart locket is rated 1.0 out of 5 by 1. Rated 1 out of 5 by Anonymous from Cheap, damaged and poor quality I brought this after a bereavement to keep a loved one close to me, I was really looking forward to its arrival. When it arrived the chain was hopelessly tangled! To add to this the item was very light and thin and the noise of it moving on the chain was horrible. It felt and looked like a cheap bit of aluminium moulded into a heart shape, it did not have the nice weight and shape as previous lockets I have owned. In addition the diamonds were dull and unexciting and the overall item looked like it needed a good polish. When I opened the locket the frames of the picture were damages, either stained or chipped. Needless to say I have complained and returned the item (which in fairness to earnest jones they have been good about). I wouldn't buy this for this price, if I had received the item having paid less than £25 I might have thought it was ok, but for its price it's looks and feels cheap!